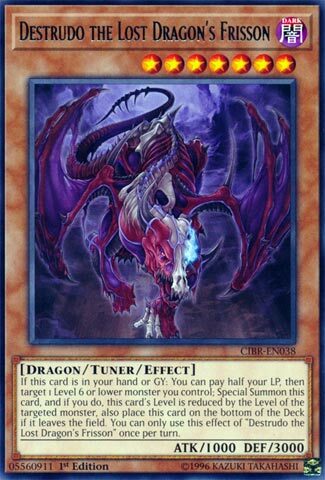 If this card is in your hand or GY: You can pay half your LP, then target 1 Level 6 or lower monster you control; Special Summon this card, and if you do, this card’s Level is reduced by the Level of the targeted monster, also place this card on the bottom of the Deck if it leaves the field. You can only use this effect of “Destrudo the Lost Dragon’s Frisson” once per turn. Destrudo the Lost Dragon’s Frisson is a card that has a great deal of breakability in this new format. Half or LP to Special Summon this Tuner from either your hand or grave is a great effect. You will always have half your LP to use, so that condition won’t be a problem. You have to have a level 6 or lower monster to activate the effect, which could be a problem if you only have Link or Xyz monsters on the field. Summon a monster lower than Level 6 and you’re golden though, so play Destrudo early in the turn before you Link or Xyz Summon. That monster then reduces your Destrudo Tuner and you can do whatever you want from there on. Synchro Summoning comes to mind first, with Destrudo making a Level 7 Synchro no matter what. You can Xyz Summon with this if you can match its new level, but Link Summoning with this card is likely your main go-to with this card. Destrudo does go to the bottom of the deck when it leaves the field, but as an Xyz material it will go to the grave. Even though it recycles itself into the deck there are ways to get it back into the grave or to your hand. It has a lot of support behind it as well being a DARK and a Dragon. It’s low ATK allows you to search it with stuff like Mystic Tomato and Sangan (though with the latter you won’t be able to use Destrudo that turn). Even if you have nothing to use Destrudo with, its 3000DEF will protect against most monsters and you will get it back to the deck when it leaves the field in any way, prompting your opponent to choose wisely their targeting effects. I don’t think I can use this card. That being said, it has great potential. Destrudo the Lost Dragon’s Frisson is a Level 7 Dark Dragon-type Tuner Monster with 1000 Atk and 3000 Def. The stats are somewhat everywhere, but the 1000 Atk does make it more searchable. Being a tuner is great because without the effect, it’s a rare regular high level tuner. Speaking of the effect it can be very expensive. You can pay half your lp once per turn to target a Level 6 or lower monster you control and Special Summon Destrudo from the hand or grave. Destrudo’s level is reduced by the level of the targeted monster and Destrudo will go to the bottom of the deck if it leaves the field after using the effect. Potentially, you should always be able to Synchro Summon a Level 7 Synchro Monster. You’ll always be able to pay half of your life points. So for consistency, this card scores well. Obviously, you can also use this in decks that XYZ or Link or Tribute Summon, the best being XYZ because then Destrudo won’t go to the bottom of the deck from being XYZ material. Excellent future and current combo potential in multiple decks makes this card score well. But for half my life points, I’d rather have Solemn Judgement back. I really enjoy cards that can help start combos, and that is what our #2 card does. It helps solidify my theory of two certain Synchros associated with FTKs from time to time being banned one day, but it is a cool card by itself. Say hello to Destrudo the Lost Dragon’s Frission. Destrudo is a Level 7 Tuner, which is the most noteworthy thing about him when it concerns his effect. If Destrudo is in the hand or GY, you can pay half your LP and target a Level 6 or lower monster you control, you can then summon Destrudo and decrease his Level by the Level of the targeted monster. The two Synchros I could see getting banned one day, Ancient Fairy Dragon and Power Tool Dragon, are both Level 7 generic Synchros associated with FTK combos. Destrudo allows you to go into nearly any Level 7 Synchro, which Ancient Fairy Dragon is becoming a favorite in Link Era, giving more of a reason for it to be banned in the future. If that isn’t needed, there are tons of great Level 7 Synchros like Black Rose Dragon, Black Rose Moonlight Dragon, Clear Wing Synchro Dragon, Samurai Destroyer, the list is pretty good. If a Level 7 Synchro isn’t good enough for you, you can Link Summon Crystron Needlefiber, which facilitates tons of combos, and is another card I can see banned in the future, especially considering it is a Link version of Denglong basically, only far more generic. Destrudo just allows you to do a ton of combos thanks to certain Extra Deck cards, and it being a Level 7, which is an odd number, XYZs are impossible with him if you use the effect thankfully. Also to note if Destrudo leaves the field after being summoned with his effect, it is sent to the bottom of the deck and also of note that this effect is a hard once per turn. Still, the combos this card can help generate makes him amazing. The runner up to best card in this set is a really interesting one. Destrudo, the Lost Dragon’s Frisson, isn’t terribly strong for a Level 7 Monster at 1000 attack, but has a massive 3000 defense wall. It receives all the support of Dark and Dragons out there, as well as being a high Level Tuner Monster as well. This card has some beautiful combo potential, starting with his effect of paying half your Lifepoints to Special Summon himself from your Hand or Graveyard, after targeting a Level 6 or lower Monster you control. Destrudo then has his Level reduced by the Level of that Monster. Being a Tuner, as stated, that grants some lovely power to abuse to Synchro immediately, ideally into at least a Level 7 Synchro, or possibly bigger, depending on what else you may have at your disposal at the time. Remember too, there are a ton of Level 7 Synchro Monsters that are very good, if you want to hard ball at staying at Level 7. This card, also as stated, is a beautiful combo piece, that can generate you mass advantage, really easily. I see why he got so high on the list.